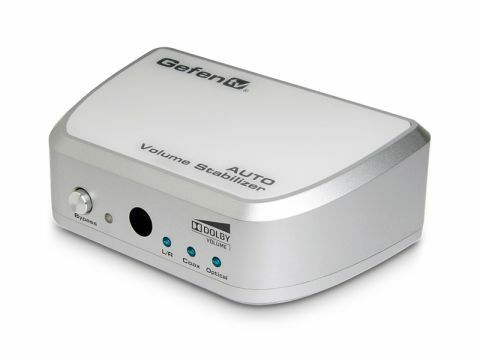 The Gefen TV Auto Volume Stabiliser uses Dolby Volume, which is a technology designed to intelligently 'normalise' loudness to avoid the annoying volume jumps familiar to late-night telly addicts, when broadcasters turn up the sound for adverts. The tech, which was modelled on psychoacoustic research conducted by Dolby, is integral to recent TVs, AVRs and this Volume Stabiliser. The device is compact and powered by a 'wall-wart'. It's also very easy to use. Remote control is also possible, courtesy of a simple three-button handset. Both digital coax and optical and analogue inputs and outputs cater for just about everything. You can also use it to convert between analogue and digital audio, with or without processing. It works very well indeed, especially with TV sources. No subjective distortion of any significance is added, and quiet details become more apparent at low listening levels because they're boosted by Dolby Volume. Some sources – eg. classical music, suffer from squashed dynamics, but you can engage the bypass mode if this is found to be too intrusive. It also doesn't work with 5.1 audio – it's two-channel stereo only. The addition of HDMI ports would have simplified connection to some applications. Naturally, only the audio would be processed here – any accompanying video would be passed through intact. It also costs more than many Blu-ray players, largely on account of all the support circuitry that's necessary.